There is something delightful about people’s excitement when an old-fashioned British steam train pulls into a station. One toot of the whistle can generate squeals from children and adults alike. Nostalgia plays a part for some, reminding them of childhood trips to the seaside. Others seem attracted by the romance of the golden era of rail travel. Younger visitors are enthralled to see a real-life Thomas the Tank Engine – the children’s story adapted for TV with a voiceover by The Beatles’ Ringo Starr. Whatever the reason, a trip on a heritage railway offers a perfect antidote to the stresses of modern-day travel. You buy a ticket and climb aboard, before slowly chugging away into the distance. And where better to do this than in Yorkshire, the setting for another children’s classic, The Railway Children by Edith Nesbit. 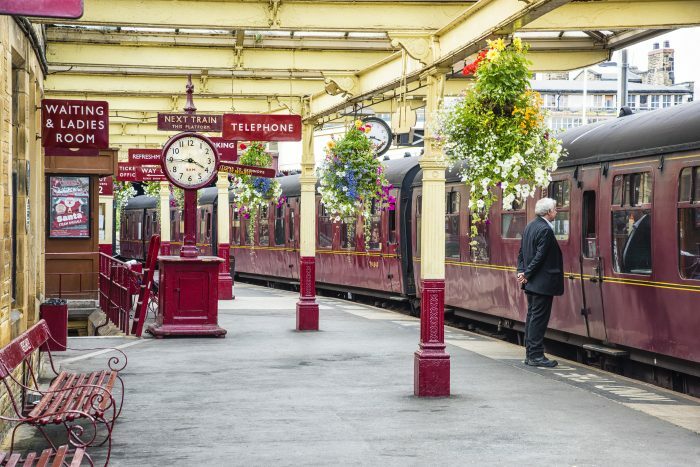 Yorkshire is particularly blessed with heritage railways and they provide a relaxing alternative way of seeing what locals call “God’s Own County”. 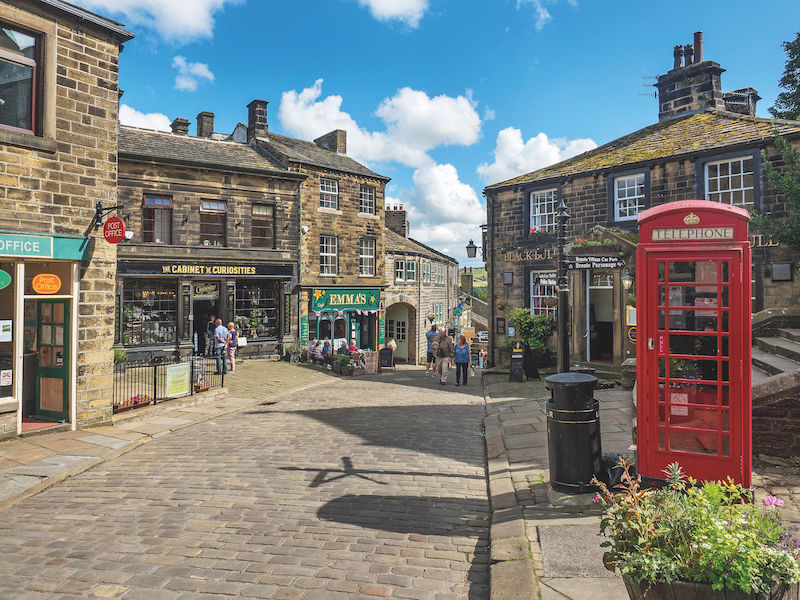 The Keighley and Worth Valley Railway (KWVR) offers an opportunity to see the former textile heartland of West Yorkshire and the hillside village of Haworth, once home to the Brontë family of author sisters. The North Yorkshire Moors Railway links the market town of Pickering with the old fishing port of Whitby, famed for its connections to both Captain Cook and Bram Stoker – more of which later. The KWVR was first built in 1867 to serve the villages and mills of the Worth Valley. It became part of the nationalised British Railways (later British Rail) in 1948 and was closed down in 1962 after Dr Richard Beeching’s review into the country’s rail network. The closure was fiercely opposed and, thanks largely to the efforts of the Keighley and Worth Valley Railway Preservation Society, the line reopened six years later. It has been run by the society’s qualified volunteers ever since and together they bought the line from British Rail with 25 years of interest free instalments. This passion and drive is still prevalent among volunteers today. The line’s main access point is Keighley, where it connects to Britain’s national rail network. The KWVR takes up platform 3 and 4 of the station, which is rather beautifully preserved in its red and cream livery, with a refreshments kiosk, small shop and a traditional style waiting room for passengers. Like many heritage railways, the KWVR alternates its various engines throughout the year. The one in operation on our day of travel was a former Midland Railway locomotive that first entered service in 1920. It was withdrawn by British Railways in 1965 and, having been rescued from a Welsh scrapyard and extensively restored, started its new life in West Yorkshire 28 years ago. There’s a distinctive smell to a steam engine – a surprisingly not-unpleasant odour of oil and smoke. Spend a day on the railway and you’re likely to come away with a fine layer of soot in your hair too, which is all part of the experience. Yet perhaps the most relaxing feature of travelling on a heritage railway is the soothing rhythmic pulse as the train chugs down the line. Any engine pulling out of Keighley has a lot of work to do before it gets to that point. The line begins with a 1:56 gradient and a quick 90-degree turn which is such a feat in railway terms that, prior to 1962, engines needed to start back beyond the station to get a run up when it rained. The line then passes former mills and factories, one-time workers’ cottages and the Copper Dragon brewery, before arriving in Ingrow West – home to two museums collectively known as Rail Story. Of particular interest here is the Carriage Works, which houses the Lord Mayor, the smallest engine on the KWVR and the one used in publicity for the 1970 film adaptation of The Railway Children. There is also a Great Northern Railway coach, first built in 1899 and featuring a rather plush toilet and sink in first class, and three London Metropolitan railway carriages. The next stop is Damems, Britain’s smallest standard- gauge station and one which you will only stop at if someone requests it. The most famous station on the line, however, is the next one, Oakworth. This is where Jenny Agutter’s character Roberta ran down the platform in The Railway Children’s most famous scene. It is also home to the Perks family’s Station Cottage, just by the crossing, and upon leaving Oakworth, the line then passes the site of the movie’s landslide before plunging into Mytholmes Tunnel. One stop later, the train pulls into Haworth and we’re in the heart of Brontë Country. It is then a steep walk up the hill from the station to the village, its cobbled main street one of England’s most picturesque. The Brontë family moved here in 1820, when the famous siblings’ father, Reverend Patrick Brontë, was appointed the local curate. They lived together at the Haworth Parsonage, now home to the Brontë Parsonage Museum. It was here that each sister would write the majority of their respective debut novels, Charlotte’s Jane Eyre, Emily’s Wuthering Heights and Anne’s Agnes Grey, all first published in 1847. All three books were written in the dining room, where the sisters stayed up late into the night, discussing their ideas while strolling around the table. 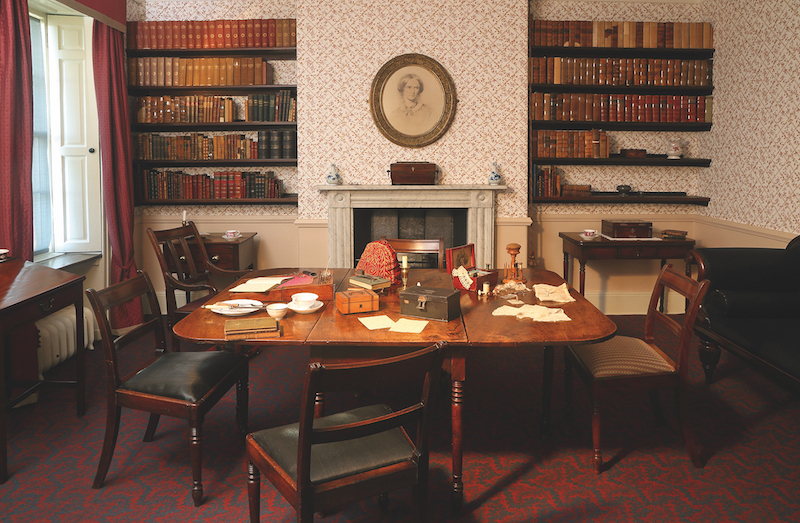 Like many of the rooms within the museum, it remains much as it was in the Brontës’ day. Among the family’s personal effects also on show are some of the tiny little books the Brontë children wrote and stitched themselves. Also in the village today you can find the Haworth Parish Church where Patrick was curate, the Black Bull pub – a regular haunt of the authoresses’ brother, Branwell Brontë – as well as a number of quaint, independent shops. Take the open-top bus to Oxenhope station, the last stop on the KWVR, and you pass through the moorland that inspired Wuthering Heights, before catching the train back towards Keighley. The KWVR may be just five miles long, but it is packed with history. Natalie travelled to Yorkshire on an escorted tour with Rail Discoveries. Experience Yorkshire by Steam on an escorted group tour with Rail Discoveries – call 01904 734 812 or visit www.raildiscoveries.com. From £375pp, the five-day trip includes three- and four-star hotel accommodation, all rail travel and excursions, and selected meals.